Motorists who fail to use sun protection whilst driving are putting themselves at risk of skin damage and cancer – even with the windows closed. New tests have shown that long-term sun exposure whilst behind the wheel may lead to leathering, wrinkles, sagging, brown age spots and possibly skin cancer. The reason for this is that glass used in cars for side and rear windows provide little to no UVA protection, leaving drivers susceptible to skin damage and cancer. Motorists who drive without sun protection are risking cancer and skin damage © Copyright Julian P Guffogg and licensed for reuse under this Creative Commons Licence. 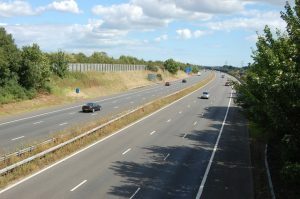 The comparison website Confused.com, carried out a test using UV photo technology to show how much damage the sun can have on a motorist. They compared the skin of two drivers, one who used sun protection and another who didn’t. The UK has enjoyed super high temperatures over the last few days, reaching above 30c in many parts of the country, with records showing it as the longest heatwave in the UK for 20 years. As a result, motorists throughout the country are being warned that not putting sun cream on whilst enjoying these extremely hot temperatures could be putting our skin in danger. Confused.com and Melanoma UK called attention to research carried out in the US, which showed that the side of a person next to a window received around 6 times the dose of UV radiation compared to the side out of the sun. Side and rear windows in vehicles only protect the skin from UVB rays which cause skin reddening and sunburn, different to windscreens which block UVB and deeper-penetrating UVA. During the test, one driver was layered up with sun protection whilst the other driver remained cream free, then both had their skin photographed using high-tech UV cameras. Both sets of photographs were then examined by a doctor who found pre-cancerous cells on the right forearm of the van driver from South Wales who confessed to hardly ever using sun protection. In comparison, motoring editor at Confused, Amanda Stretton, who often used cosmetics which contained SPF, had little to no sun damage. What these results highlighted was just how much damage can be done to a driver’s skin when they fail to use the right sun protection, which many people in the UK choose to ignore or have no idea of the dangers, even when the temperatures soar to 30c. As part of a survey, 2,000 UK motorists were asked questions relating to the sun and driving. An alarming four out of five said they never worried about skin damage whilst behind the wheel on a sunny day – 53% had no idea that this can happen even when the car windows are closed. One in seven drivers admitted to not putting sun cream on inside the car or outside when the weather was sunny and hot. The survey also found that 26% of drivers had suffered from sunburn whilst behind the wheel, whilst 13% admitted to putting their window down to top up their tan whilst driving. What was even more worrying was the fact that 14% confessed to sticking their right arm or another part of their body out of their car window to improve their tan – around one third of these sun worshippers also admitted to having a near miss or an accident because of their actions. Please click here, or give us a call on 0800 311 8290 to find out more about our car leasing services and fantastic deals.